The Atlas (the first cervical vertebra - C1) differs from the other cervical vertebrae in that it has no body or spinous process. It is comprised of two bony arches with two bony masses laterally. It articulates with the Occiput above and C2 (the Axis) below. The anterior arch forms about one-fifth of the ring. Its anterior surface is convex, and presents at its center the anterior tubercle for the attachment of the Longus colli muscles and the anterior longitudinal ligament. Posteriorly it is concave, and marked by a smooth, oval or circular facet (fovea dentis), for articulation with the odontoid process (dens) of the axis. The posterior arch forms about two-fifths of the circumference of the ring. It ends behind in the posterior tubercle, which is the rudiment of a spinous process and gives origin to the Recti capitis posteriores minores and the ligamentum nuchae. The diminutive size of this process prevents any interference with the movements between the atlas and the skull. The posterior part of the arch presents above and behind a rounded edge for the attachment of the posterior atlantooccipital membrane, while immediately behind each superior articular process is a groove (sulcus arteriae vertebralis), sometimes converted into a foramen by a delicate bony spiculum which arches backward from the posterior end of the superior articular process. 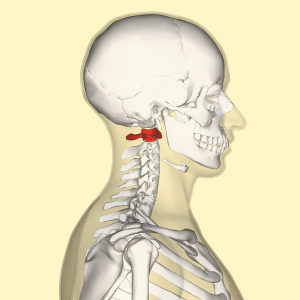 This groove represents the superior vertebral notch, and serves for the transmission of the vertebral artery, which, after ascending through the foramen in the transverse process, winds around the lateral mass in a direction backward and medially; it also transmits the suboccipital nerve (first spinal nerve). In a common anatomic variant the vertebral artery passes through an arcuate foramen. On the under surface of the posterior arch, behind the articular facets, are two shallow grooves, the inferior vertebral notches. The lower border gives attachment to the posterior atlantoaxial ligament, which connects it with the axis. The superior facets are of large size, oval, concave and directed upward, medially, and a little backward, each forming a cup for the corresponding condyle of the occipital bone and allowing nodding movement of the head. The inferior articular facets are circular in form, flattened or slightly convex and directed downward and medially, articulating with the axis, and permitting the rotatory movements of the head. The medial aspect of each mass has a tubercle for the attachement of the transverse ligament. Just below the medial margin of each superior facet is a small tubercle, for the attachment of the transverse atlantal ligament which stretches across the ring of the atlas and divides the vertebral foramen into two unequal parts: the anterior or smaller receiving the odontoid process of the axis the posterior transmitting the spinal cord (medulla spinalis) and its membranes This part of the vertebral canal is of considerable size, much greater than is required for the accommodation of the spinal cord. The transverse processes are large; they project laterally and downward from the lateral masses, and serve for the attachment of muscles which assist in rotating the head. They are long, and their anterior and posterior tubercles are fused into one mass; the foramen transversarium is directed from below, upward and backward. Superiorly the atlas articulates with the occiput to form the Atlanto-occipital joint which allows the head to nod up and down on the vertebral column. Inferiorly the atlas articulates with the dens which acts as a pivot that allows the atlas and attached head to rotate on the axis. This is the Atlanto-axial joint. A break in the first vertebra is referred to as a Jefferson fracture.